1. They prefer bright yet indirect light, so perfect for sunny rooms in your home. 4. They reproduce readily, sending off baby offshoots that can be easily transplanted. That is why they are often called the Pass-It-Along or Friendship Plant, since friends often pass the baby plants on. 5. They have a super appealing look with those round glossy and deep green leaves. PILEA PEPEROMIOIDES is a flowering plant, belonging to the family Uricaceae, natively found in the Yunnan Province of Southern China (why you might hear it referred to as the “Chinese Money Plant”). The PILEA is a perennial evergreen succulent (in that it stores water within its parts). Story goes that these attractive plants were brought back to Europe by a Scandinavian explorer in the mid-twentieth century. Due to the fact that these plants produce lots of baby offshoots that are easily transferred, these prolific cuties were soon sprouting up as a popular houseplant throughout Scandinavia. 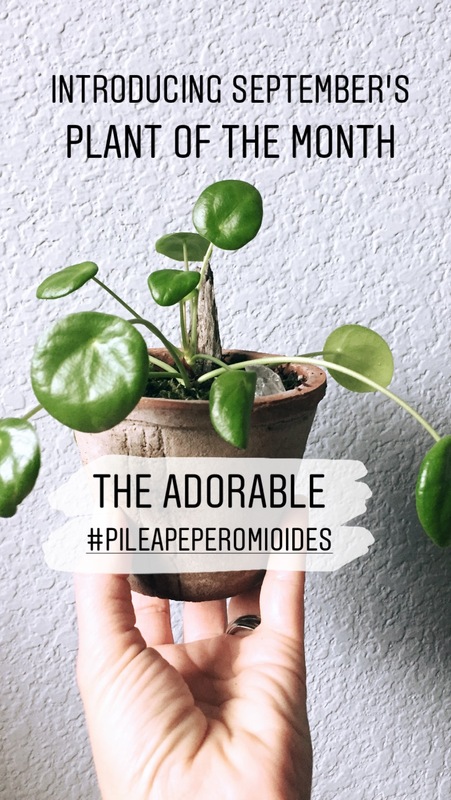 Despite the fact that it had been used in China, and was “discovered” by European botanical explorers centuries beforehand, it wasn’t until the 1980’s that the PILEA PEPEROMIOIDES was officially identified and given its name. WATER: Typically water about once a week, yet always check the soil. They prefer to have very mildly damp soil, although don’t like to sit in wet soil (drainage hole in planters is preferred). When the leaves start to look droopy it is a sign that it is time to water. SUNLIGHT: These plants prefer bright indirect sunlight, so they are great for sunny spots in your home. They grow fast so it is recommended to rotate your plants about once per week so that the leaves and stem don’t slant toward the sun. AND MORE: I read that they benefit from monthly fertilizing in spring and summer months (I haven’t fertilized mine yet so I’ll be sure to next time I water). You also want to clean the leaves of dust from time to time to help with optimal photosynthesis. Cut with clean shears/knife, then either plant directly into moistened soil or water propagate to activate root growth. Keep soil moist (but not too wet) for about 4-6 weeks before they have fully grown in their roots and they start sprouting new leaf growth as well! If you have any questions regarding caring for Sansevieria don't forget about our new ASK the Botanist page!